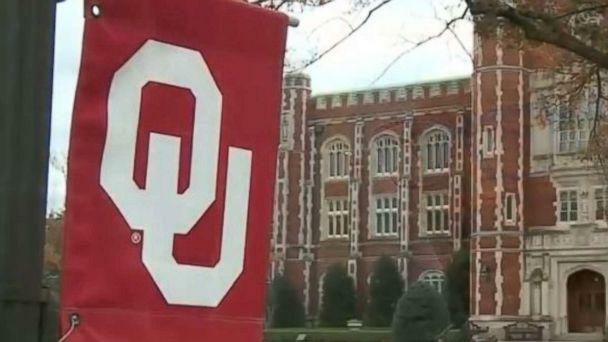 A racist video that swept across the campus of the University of Oklahoma this week received widespread condemnation and resulted in one student being kicked out of her sorority. The video was posted to Twitter on Friday and includes a student from the Tri Delta sorority filming her friend as she is painting her face black. The student filming the video jokes, "Stop, that's too much paint!" The student, with her face painted black, then flicks off the camera and uses the N-word. Officials have not named either woman involved in the video, but Oklahoma's Tri Delta chapter quickly moved to expel the woman who filmed the video from the sorority on Saturday. The student on camera who used the slur was not a member of the sorority. "Our chapter condemns the racist, offensive and disgraceful conduct of the two women involved in the video posted yesterday," Theta Gamma Delta Delta Delta Collegiate Chapter President London Moore said in a statement posted to Instagram. "More specifically, we are deeply disappointed in the actions of the one woman associated with the Theta Gamma chapter of Tri Delta. "The behavior documented in the video is abhorrent and is in no way consistent with Tri Delta's ideals. ... Chapter leadership has met and appropriate action has been taken. The woman who participated in, filmed and posted the video is no longer a member of our organization." Tri Delta also said in the statement it would "make strides toward change." Oklahoma President James Gallogly and Dr. Jane Irungu, interim associate vice president of the Office of University Community at OU, issued a joint statement on Friday: "We are saddened and offended that on the eve of such an important holiday for our nation we are reminded how far we have yet to come in the conversation about treating everyone with respect and dignity. Martin Luther King, Jr. said, 'The function of education is to teach one to think intensively and to think critically. Intelligence plus character -- that is the goal of true education.'" Gallogly said the school "abhors such conduct and condemns" the actions and language in the video, but it appears punishment from the school will be limited. "The students have offered to apologize in order to reflect their regret," the president's letter notes. "My role now is to move quickly to educate, to inform, and I'm glad that meeting with these two young women they acknowledged their mistake and we shall move on from there," Irungu told Oklahoma City ABC affiliate KOCO. The university received widespread negative attention in 2015 after members of the Sigma Alpha Epsilon fraternity were filmed singing a racist song to the tune of "If You're Happy and You Know It" while on a bus. The video was released online and the frat was later closed and two members were kicked out by then-President David Boren. Boren retired as president prior to the current school year.